Recently a colleague of mine ask me to provide a simple example on how ProxySQL can perform sharding. ProxySQL is a very powerful platform that allow us to manipulate and manage our connections and query in a simple but effective way. In this article I will show you how. Before starting is better to clarify some basic concepts. ProxySQL organize its internal set of servers in Host Groups (HG), each HG can be associate to users and to Query Rules (QR). Each QR can be final (apply = 1) or can let ProxySQL continue to parse other QR. A QR can be a rewrite action, or can be a simple match, it can have a specific target HG, or be generic, finally QR are defined using regex. You can see QR as a sequence of filters and transformation that you can arrange as you like. These simple basic rules give us enormous flexibility, and allow us to create very simple actions, like a simple query re-write or very complex chains that could see dozens of QR concatenated. The information related to HG or QR is easily accessible using the the ProxySQL administrator interface, in the tables mysql_servers, mysql_query_rules and stats.stats_mysql_query_rules; the last one allow us to evaluate if and how the rule(s) is used. About sharding, what ProxySQL can do for us to achieve what we need in a (relatively easy) way? Some people/company include sharding logic in the application, and use multiple connection to reach the different targets, or have some logic to split the load across several schemas/tables. ProxySQL allow us to simplify the way connectivity and query distribution is suppose to work reading data in the query or accepting HINTS. No matter which kind of requirements the sharding exercise can be summarize in few different categories. In the following examples I will show how to use ProxySQL to cover the three different scenario defined above and a bit more. Please note that mysql console MUST use the -c flag to pass the comments in the query. This because the default behaviour, in mysql console, is to remove the comments. I am going to illustrate procedures that you can replicate on your laptop. This because I want you to test directly the ProxySQL functionalities. For the example describe below I have used PrxySQL v1.2.2 that is going to become the master in few days. Shard inside the same MySQL Server using 3 different schemas split by continent. Obviously you can have any number of shards and number of relative schemas. What is relevant here is to demonstrate how traffic can be redirect to different targets (schemas) maintaining the same structure (tables). This discriminating the target on the base of some relevant information in the Data or pass by the application. Ok let us roll the ball. For this exercise you can use single host or multiple servers in replica. We will create the following Schemas Asia, Africa, Europe first. I am now going to query the master (or a single node) but I am expecting ProxySQL to redirect the query to the right shard catching the value of the Continent. Well you can say ... "hey you are querying the schema world, of course you get back the correct data". But this is not what had really happened, ProxySQL did not query the schema world but the schema Europe. Rule 31 in ProxySQL will take all the FIELDS we will pass in the query, it will catch the CONTINENT in the where clause, it will take any condition after the WHERE and it will reorganize the query all using the RegEx. Pass a hint inside a comment. Now what I want to have is that *ANY* query that contains comment /* continent=X */ should go to the continent X schema, same server. To do so, I will instruct ProxySQL to replace any reference to the world schema inside the the query I am going to submit. I have defined mainly to concatenated rules. The first capture the incoming query that contains the desired value (like continent = Asia). If the match is there ProxySQL will exit that action, but while doing so it will read the Apply field and if Apply is 0 it will read the FlagOUT value. At this point it will go to the first rule (in sequence) that has the value of FlagIN equal to the FlagOUT. The second rule will get the request and will replace the value of world with the one I have define. In short it will replace whatever is in the match_pattern with the value that is in the replace_pattern. Now what happens here is that ProxySQL implement the Re2 google library for RegEx. Re2 is very fast but has some limitations, like it does NOT support (at the time of the writing) the flag option g.
In other words if I have a select with many tables and as such several "world." Re2 will replace ONLY the first instance. The other day with Rene' we were discussing how to solve this given the lack of implementation in Re2. Finally we had opted for recursive actions. It means that ProxySQL from v1.2.2 now has a new functionality that allow recursive calls to a Query Rule, the maximum number of iterations that ProxySQL can run, is managed by the option (global variable) mysql-query_processor_iterations. Mysql-query_processor_iterations define how many operation, a query process can execute as whole (from start to end). This new implementation allow us to reference a Query Rule to itself in order to be executed multiple times. If you go back you will noticed that QR 34 has FlagIN and FlagOUT pointing to the same value of 25 and Apply =0. This will bring ProxySQL to recursively call rule 34 until it change ALL the value of the word world. As you can see ProxySQL has nicely replace the word world. How I can shard redirecting the queries to an Host? The main point is that whatever match the rule, should go to a defined HG.No rewrite imply which means less work. So how this is done?As said before I have 3 NODES 192.168.1. [5-6-7]For this example I will use world db (no continent schema), distributed in each node, and I wil retrieve the node bind IP to be sure I am going on the right place. What I will do is to instruct ProxySQL to send my query by using a HINT to a specific host. I choose the hint "shard_host_HG" and I am going to inject it in the query as comment. In this example we have NO replace_pattern this is only a matching and redirecting Rule, where the destination HG is defined in the value of destination_hostgroup attribute while inserting. In the case for Africa is HG 30. Which match perfectly with our returned value. Another way to assign to which final host a query should go is to use the the destination_hostgroup, set the Schema_name attribute and use the use schema syntax in the query. I mention this method because is one of the most common at the moment in large companies using SHARDING. But it is not safe, because it relays on the fact the query will be execute in the desired HG. While the risk of error is high. This will probably generate an error because shard03 is probably NOT present on the host containing shar01. As such this approach can be used ONLY when you are 100% sure about what you are doing and when you are sure NO query will have explicit schema declaration. As you can see rule 11 has two HITS, which means my queries will go to the associated HG. But given Apply for rule 11 is =0, ProxySQL will first continue to process the QueryRules. As such it will also transform the queries as for rules 31 and 32, each one having the expected number of hits (1 the first and the 4 because the loop, the second). to shard base on a MOD value Like handle table sharding based on the mod of the user id? such that `insert into 'foo' ('user_id', 'name') values (180, 'bar')` becomes `insert into 'foo_X ('user_id', 'name') values (180, 'bar')` based on 180 % 25, where 25 is the number of sharded tables. Based on 180 % 25, where 25 is the number of sharded tables. It is obvious that I need to acknowledge and kudo the work Rene' Cannao is doing to make ProxySQL a solid, fast and flexible product. I have also to mention that I was and am working with him very often, more often than he likes, asking him fix and discussing with him optimization. Requests that he try to satisfied with surprising speed and efficiency. Some time ago, I published the article “AWS Aurora Benchmarking - Blast or Splash?”. In which I was analyzing the behavior of different solutions using synchronous replication in AWS environment. After I published it, I received a lot of comments and feedback, from the community and from Amazon engineers. Given that I had decide to perform another round of tests, keeping into account the comments received and the suggestions. I had presented some of the results during the Percona conference in Santa Clara last April 2016. The following is the transposition into an article of that presentation with more details. Very good question, with an easy answer. Aurora is a product that is still under development and code refining, six months of development could present major changes in performance. Not only, the initial tests where focus on entry level solutions, meaning I was analyzing that kind of user, that are currently starting their business and looking for a flexible solution allow them to save money and scale. This time I had put the focus on enterprise solution, analyzing what an already well establish company would eventually get when in the need to find for a decent scalable solution. As such two different scenarios. I had used many different benchmarking tool, and I am still planning to run others. Why so? Why don’t simply relay in one of them? Again simple answer, I had use different tools because in some case they provide me different way of access and use data. Not only, I do not trust benchmarking tools, not even the one I had developed, as such I want to tests same thing using different tools and compare results, ONLY if I see a common pattern, then I consider the test valid. Personally I tend to discard any test is not consistent or analysis performed using a single benchmarking tool. In my opinion be lazy is not an option when doing this kind of exercises. I was analyzing the capacity to serve load in different conditions, from light load up to full utilization and some degree of saturation or resources. 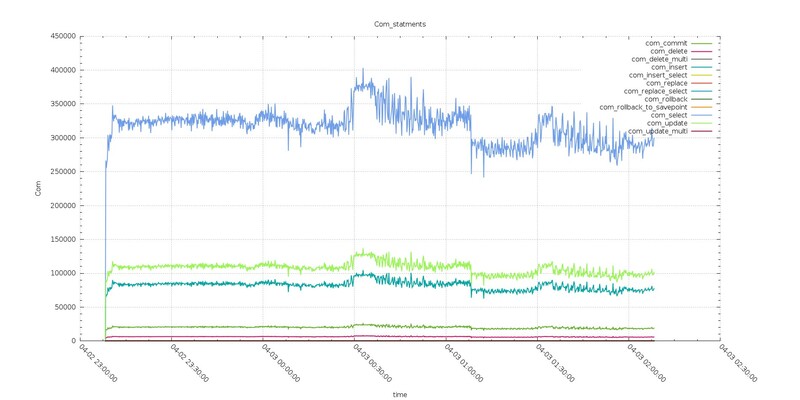 First set of tests was to evaluate simple load on a single table causing the table to become a hotspot and showing how the platform would manage the increasing contention. Second set of tests was to perform similar load but distributing it cross multiple table and batching the operations. Parallelization, contention, scalability and distributed hotspots where in the picture. The two above were focus on write operation only, and were done using different tools comparing the results given they were complementary. Third set of tests, using my own stresstool, was focus on R/W oriented usage. Performed tests execute against multiple tables, performing CRUD actions, using simple and batch insert, reads by PK, index, by range, IN and exact match conditions. Fourth set of tests was performed using TPC-C like load (OLTP). Fifth set of tests was using Sysbench in OLTP mode with 250 tables. It was difficult to compare apple with apple here. And I think that is the main point to keep in mind. Aurora is not a standard RDS solution, as we were used to have. Aurora looks like MySQL, smell like MySQL, but is not vanilla MySQL. To achieve what they have to achieve the engineers there had to change many parts, and the more you dig the more you realize there are significant differences. Because that I had to focus more on identify what each solution can do, comparing solutions against expectations, instead comparing the numbers for the numbers. I was more interested to see, what happen if I have a burst of connections and my application will go from 4K to 40K connections. Will it crash? Will it slow down? How long I should wait if a node fails? What should I prevent to have in my schema design, in order to do not have bottlenecks. In this context, those in my opinion, are relevant questions, more than discover that solution A can have 3000 rows written/sec and the other can have 3100. Or that I may (may) have some additional page rotation, file -> memory-> flush because the amount of memory differs. Those are valuable information too, for sure, but less than have a decent understanding of which platform will help my business to grow and remain stable. What is the right tool for the Job? This is the question I was addressing. It was pointed to me that I had deliberately choose to use an Ec2 solutions for PXC with less memory than the one available in Aurora. This is true, and we must keep in to consideration. Reason for this is the fact that the only Ec2 solution matching the memory of a db_r3.8xlarge is the d2.8xlarge. I did try it but the level of scalability I got from the CPU point of view was less efficient than the one available with c3.8xlarge. Given that I had decide to prefer CPU resource to memory here, especially because I was going to test, concurrency and parallelism in conjunction to load increase. From the result I got I feel confident that I choose right, but I am open to comment. Aurora has few key concepts that must have clear in mind. Especially how it manages the writes cross replica, and how connections are implemented. To replicate the information across the different storage, Aurora replicate FRM files and data coming from IB_LOGS only. This is a quite significant advantage to other form of replication, given the limited number of bytes that are replicated over the network also if they are replicated for 6 times. 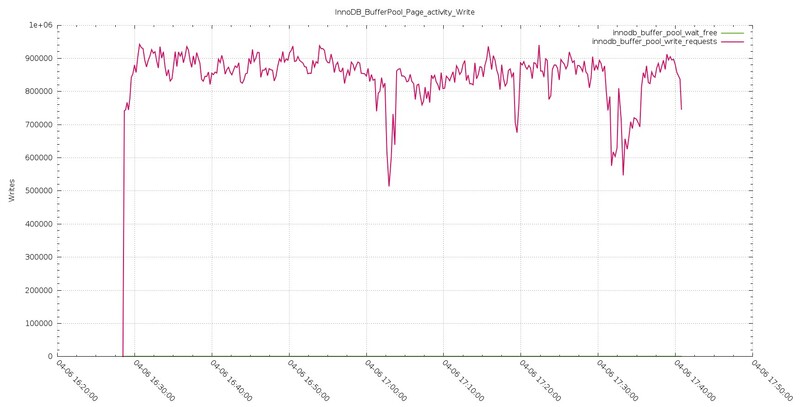 Another significant advantage is that Aurora does not use double write buffer which is obviously another blast (see recent optimization in Percona Server https://www.percona.com/blog/2016/05/09/percona-server-5-7-parallel-doublewrite/ ) . Simplifying, writes in Aurora are organized filling its commit queue and pushing the changes as group commit to the storage. Now in some presentations you may have seen that all steps are asynchronous, but is important to underline that a commit is acknowledge by Aurora when at least 2 AZ had received and wrote the incoming data related to that commit. Writes here means received in the storage node incoming queue, and with a quorum of 4 over 6 nodes. This means that no matter what, data has to travel on the network reach the final destination and ack signal come back, before Aurora returns the ack to the commit operation. Network is in the same region but still it could represent an incognita about performance. No wonder if we may have some latency at this stage. As you can see what I am reporting is also confirmed in the image below and in the observations, point is that from that slide is not clear the impact of the step 1 – 2. Oh yes, Aurora use thread pooling, a lot. That will become very clear later, and more the work is based on parallelism, more efficient thread pooling seems to be. In most cases we are used to see CPUs on database servers not fully utilized, unless some heavy ordering operation or bad query. That behavior is also (not only) a direct consequence of the connection-to-thread model, that imply period of latency and stand by. In Aurora the incoming connections are not following the same model, instead the pool redistributes the load of the incoming connection to a pool of threads, optimizing the latency period, resulting in a higher CPU utilization. Which is what you want from your resource, to be utilized and not sit there waiting for something else to do its job. Without additional waste of electronic ink, let see what comes out by this round of tests (not the final one by the way). To simplify the reading, I will report also the graphs from the first set of tests, but will focus on the latest, Small Boxes = SB, Large Boxes LB. As declared previously my scope was to verify how the two platforms would have reacted to simple load focus on insert on a basic single table, bufferpool was saturated before the running. As we can see in presence of a hot spot the Solution using PXC outperform the Aurora, in both cases. What is notable though is that while PXC remain approximately around the same time/performance, Aurora is significantly reducing the time taken. This shows that Aurora was actually taking advantage of the more powerful platform while PXC was not able to. Analyzing in more details what was happening, we can notice that Aurora is actually performing atomically better. It was able to manage more writes/second as well as rows and page managed. But it was inconsistent, Aurora was having performance hiccups at regular intervals. As such the final result was that it takes more time to process the whole workload. I was not able to dig a lot given some metrics are not fully available in Aurora, as such I had to fully rely on Aurora engineers who mention me the hot-spot contention as possible issue. 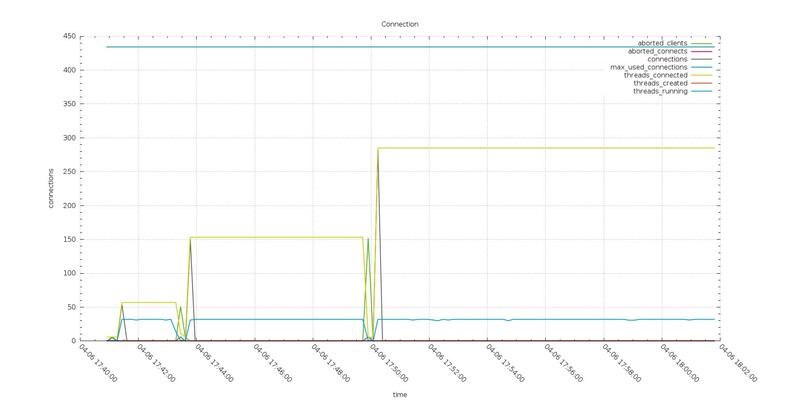 The execution in PXC is showing less calls but constant performance, while Aurora has hiccups. The trend shown by the handler stay consistent in the page management and rows insert, as logically expected. As mention this test see many threads from different application servers inserting by batch of 50 statement against multiple tables. While with small ones the situation was the inverse. But here starts the interesting part. The results are also quite constant and not significantly decreasing like the inserts with PXC. But the number of Handler commits are significantly less. Once more they stay the same on the load increase, without impacting performance. We have two things to notice here, the first one is that PXC has a decrease in performance while processing the load, while Aurora has not. The second (you need to zoom the image) the number of commit is floating in PXC while it stays fix in Aurora. Even bigger surprise comes up when reviewing the connections graphs. As expected PXC is having all my connections open there and the number of threads running is quite close to what is the number of the threads connected. And both of them follow the increasing number of connected threads. Also if my applications are actually trying to open ~800 threads, the Aurora node see only a part of them, and the number of running is fix to 32 threads. Thing to consider here are the following, first my applications does not connect directly to Aurora instance, but to a connector (MariaDB). Second Aurora, in this case, cap the number of running threads to the number of CPU available on the instance (here 32). Given that I may expect to have worse performance, but I do not. The fact that Aurora use one thread for multiple connections seems working quite efficiently here. See also the number of Rows inserted is consistent with the handler calls and better performing than PXC. Again we have the same trend, only this time we have Aurora able to perform definitely better than PXC. With large box I had the inverse, Aurora is outperforming PXC by many times, being from two up to almost 7 times faster then PXC. Analyzing the number of commands executed with increasing workload, we can see how PXC is able to perform better than Aurora with a workload of 128 threads, but is starting to have worse performance as the load increase. On the other hand, Aurora is able to manage the load and in read/write without significant performance loss, that include being able to increase the number of commits/sec. 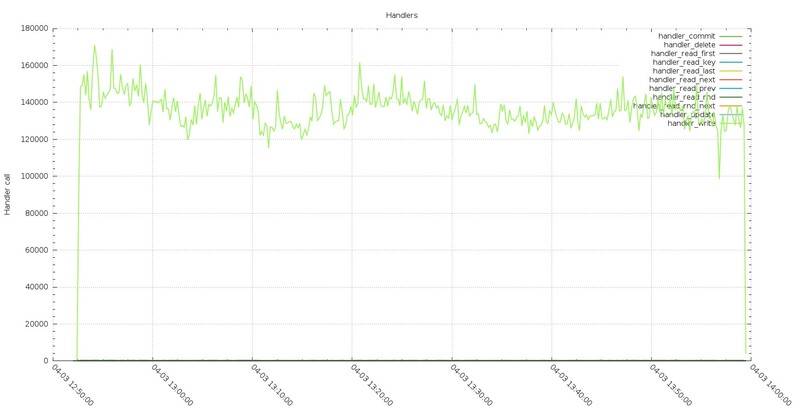 Reviewing the Handler calls, we see gain that the Handler commit calls are significantly less in Aurora as already noticed in the ingest tests. The other thing to notice, is that the number of calls for PXC is significantly higher and not scaling, while Aurora has a nice scaling trend. Tpcc test is main to test OLTP traffic, with the note that some tables like district my become a hotspot. The tests I run were executed against 400 warehouse and using 128 Threads as maximum for the small box and 2048 threads for the Large. During this test I hit one of the Aurora limitation and I had escalated that to the Aurora engineers, who are aware of the problem. In the case of small boxes, there is nothing to say, PXC is able to manage the load more efficiently, also if his trend is not optimal having significant fluctuation. Aurora is just not able to keep the it up. Different and a bit more complex scenario in the case of the use of large boxes. And as you can see this is true for 2 tests over 3, and up to when it got stuck by internal limitation, Aurora was also performing better on the 3td. But then its performance just collapse. Performing more in depth investigation I noticed that under the hood, Aurora was not performing as well as it looks like. That comes out quite clear performing comparison between few graphs covering Comm_ execution, Open Files, Handlers and Innodb row lock time. In all of them is quite evident how PXC is able to keep serving the workload with consistent behavior, while Aurora fails from the second test on (512 threads), and not only on the 3td with 2048 threads. 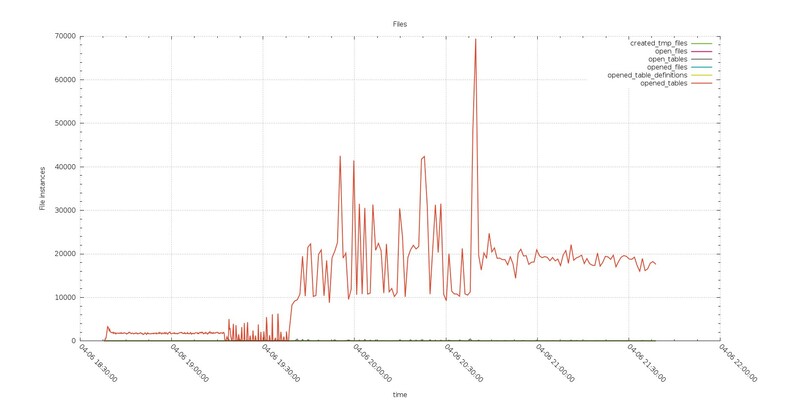 It is clear how Aurora was better serving during the test with 256 threads going over the 450K com select serve (in 10 sec interval), comparing with PXC that was not able to go over 350K. But in the tests after while PXC was able to keep going, also if with decreasing performance, Aurora was starting to struggle, with very inconsistent behavior. 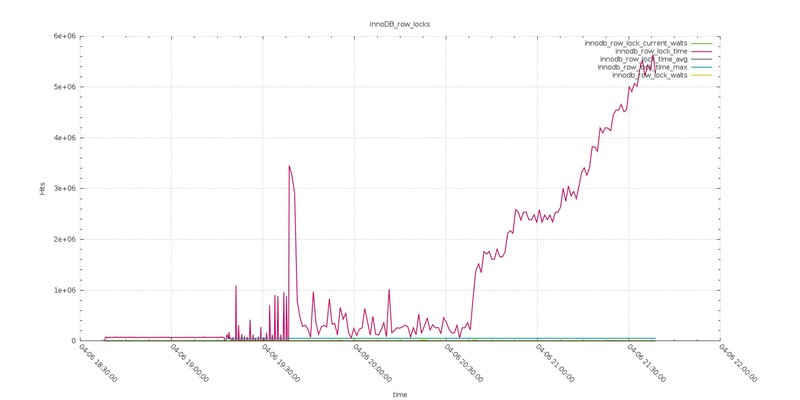 The graphs show the instance of files open during the running, not the one already open. It reflect the Open_file metric “The number of files that are open. This count includes regular files opened by the server. It does not include other types of files such as sockets or pipes. Also, the count does not include files that storage engines open using their own internal functions rather than asking the server level to do so”. I was quite surprise by the number of files open by Aurora. So what was instead reversely increasing? As you can see from the above, the exactly same workload, had generate an increasing lock row time, from quite low in the test with 256 threads, up to crazy high in the one with 2048 threads. As mention we know that TPCC has a couple of tables that works as hotspots, and we had already saw with IIbench how Aurora is not working efficiently in that cases. As additional information during the tests, I was getting a lot of 188 errors, this is an Aurora internal error. When I report it, I was told, they know about it, and they are planning to work on it. I hope they will do soon, because if this issue is solved it is very likely that Aurora will not only be able to manage the tested workload, but go over it by far. I am saying this because also with the identified issues Aurora was able to keep going and manage a more then decent response time during the test2 with 512 threads. I add the sysbench tests to test the scalability, and to see the what happen when the system reaches the saturation point. This test brought up some limitation existing in the Aurora solution, more related to the connector than the Aurora engine itself. Aurora has a limit of 16k connection, as said I was looking to see what happens if I got to saturation point or close to it. It doesn’t matter if this is a crazy high number or not. 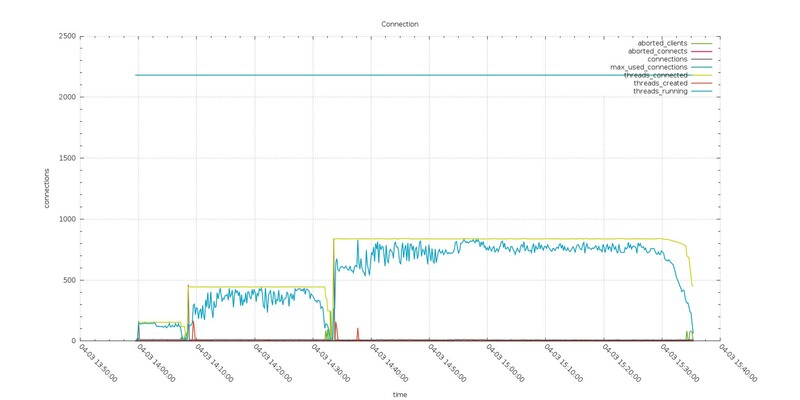 What happened is that I was able to have Aurora managing traffic up to 4K but the more I was going close to the limit, the more I was having issue in connectivity, more than anything else. 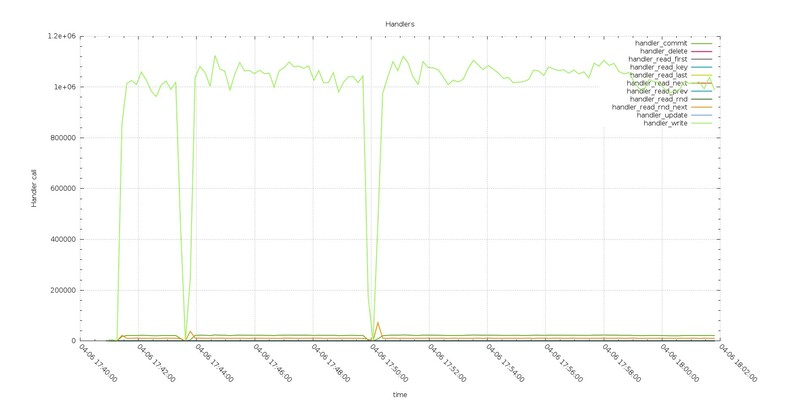 At the end I had to run the test with 8k 12k and 20k threads pointing directly to the Aurora instance, bypassing the connector that was not able to serve the traffic. After that I was able to hit up to ~15500 Threads but with a lot of inconsistent performance. 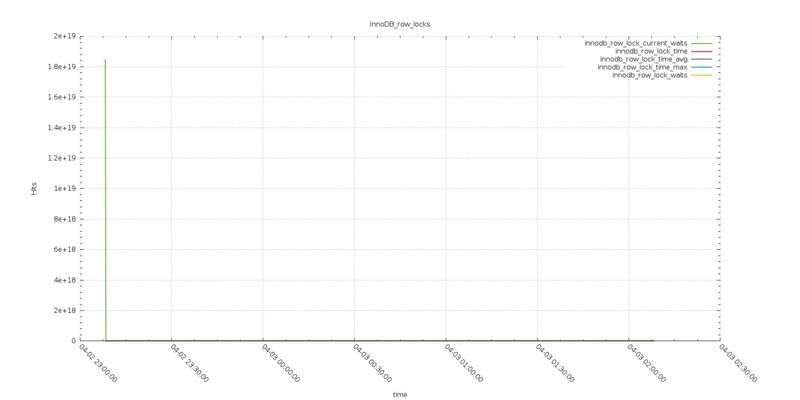 Given that I am defining the limit of meaningful test to the previous level of 12K threads. PXC was able to scale up to 16K no problem. What also is notable here is that Aurora was able to mange the workload more efficiently in terms of transaction handling as transactions executed and latency. The number of transaction executed by Aurora were ~three times the one executed by PXC. Also in term of latency Aurora was showing less latency then PXC. Internally Aurora and PXC operations were once more different in terms of how the workload was handle. The most diverging result was the handlers calls. 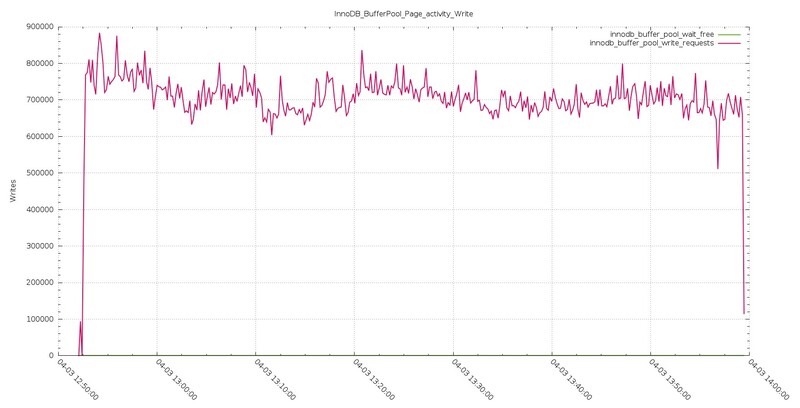 Commit calls in Aurora were a fraction of the calls in PXC, while the number of rollback was higher. 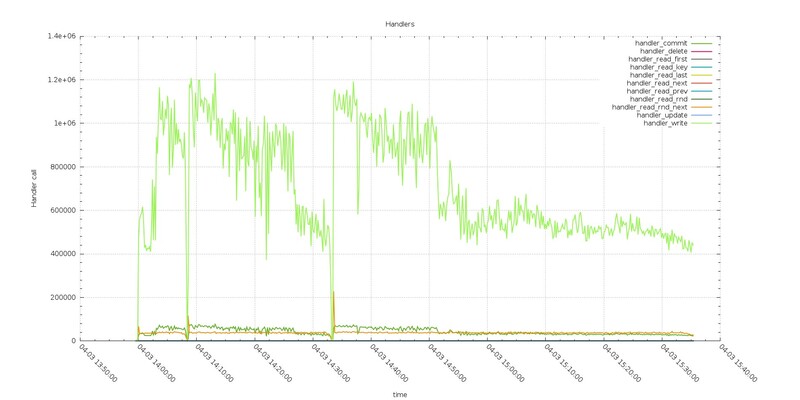 The read calls had an even more diverging behavior, with PXC performing high number of read_keys, while Aurora was having a very limited number of them. Read_rnd are very high in PXC but totally absent in Aurora (note that in Aurora, read_rnd are reported but seems not really increasing). On the other hand, Aurora report a high number of read_rnd_next while PXC has none. 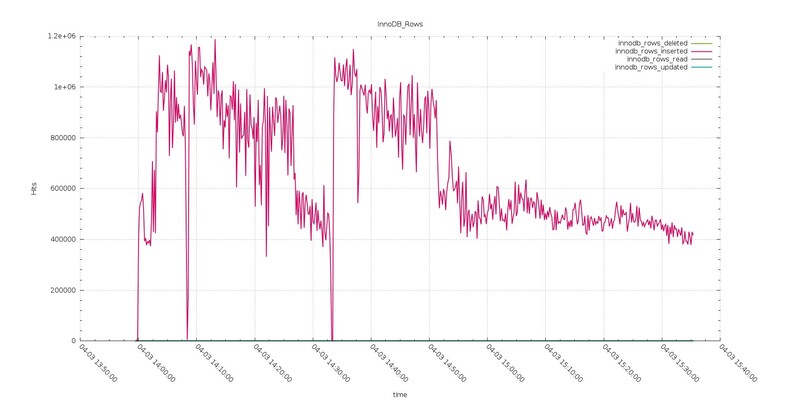 In this test the fail-over time had seen the solution using Galera and HAProxy to be more efficient. That was happening with limited or mid level load, one assumption is that given Aurora has in any case to verify the status of the data transmitted and its consistency across the 6 data store node, the process is not so fast as it could be. Or, another assumption, it could be that the cluster connector is not as efficient as it should in redirecting the traffic from one node to another. It would be a very interesting exercise to replace it with some other custom solution. 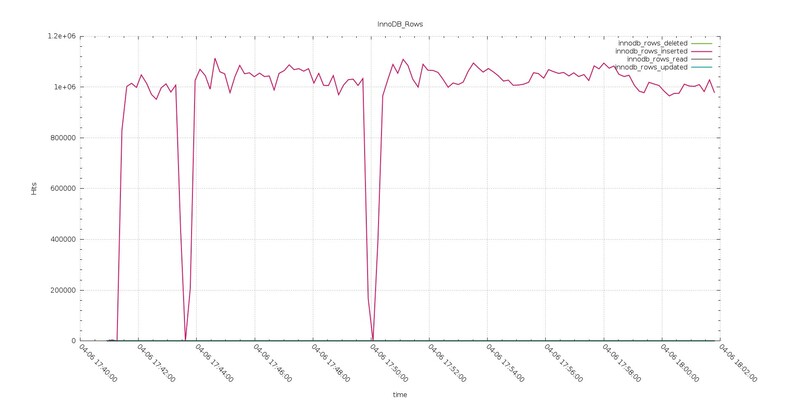 It is worth mentioning that of the 8 seconds taken by MySQL/Galera to perform the failover, 6 were due to the HAProxy settings which had 3000 ms interval and 2 loops in the settings before executing failover. 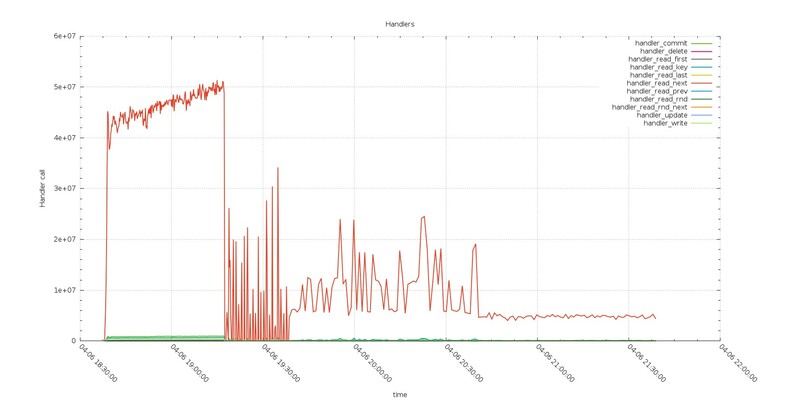 The scope of this tests, was to identify the latency existing between the moment that application send the request, and the moment MySQL/Aurora take the request in “charge”. The expectation is that the more the database will get busy, the longer latency will exist. For this test I had report both results, the one coming from old test with small box and the new one with large box. It is clear from the graphs that the two tests report a different scenario. In the first Galera was able to manage the load more efficiently and serve requests with lower latency. For the new tests, I had utilized higher number of threads than the ones for the small box, nevertheless in the second CPUs utilization and the number of running threads drive me to think Aurora was finally able to to utilize the resource more efficiently and the latency, just drop. 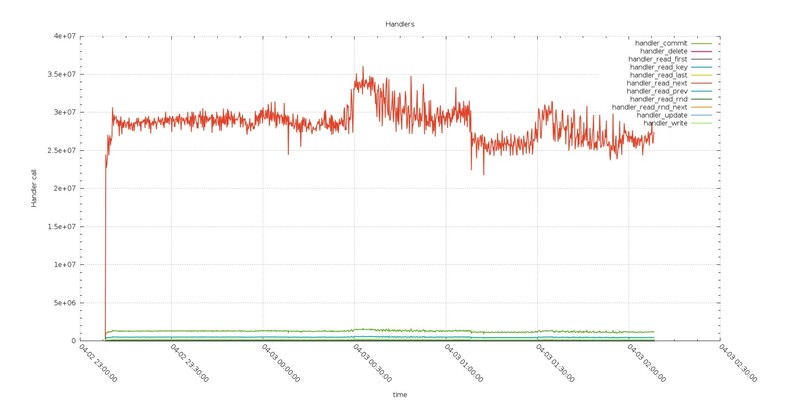 To mention, that latency was jumping up again when the number of connection was going above the 12K, but that was expected given previous tests results. 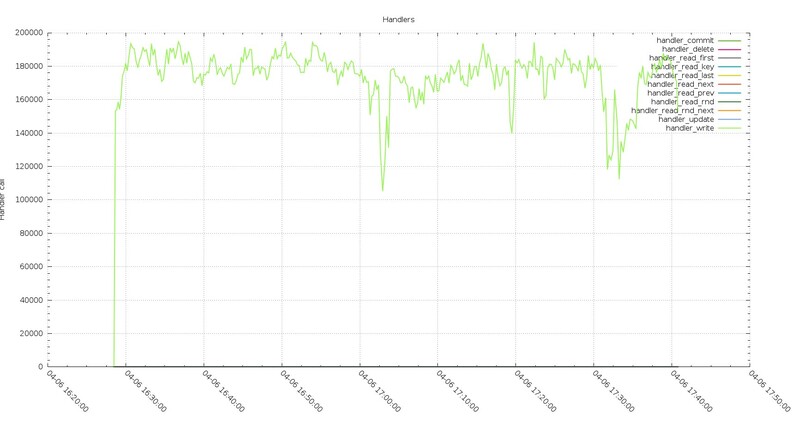 The two platforms were shown to be able to manage the failover operation in a limited time frame (below 1 minute). Nevertheless, MySQL/Galera was shown to be more efficient and consistent. This result is a direct consequence of the synchronous replication, that by design brings MySQL/Galera in to not allow an active node to fell behind. In my opinion the replication method used in Aurora, is efficient, and given data is shared across the read replicas, fail-over should happen faster. I had suffered a lot during the tests because the connector, and I have the feeling that having another solution in place may bring some surprise, and actually I would really like to test that as well. In this run of tests Aurora was able to invert the results I had in the first test with the small boxes. In almost all cases I had Aurora performing as well or better then PXC. There are still cases where Aurora is penalized and those are the ones where hotspots are present, and contention in Aurora is killing the performance, and raise errors (188). But I hope we will see a significant evolution soon. The product is evolving quickly, and benchmark results may become obsolete in very short time, this is why is important to have repeatable and comparable tests. From my point of view, in this set of tests Aurora had clearly show where it fits better. Critical applications that require High Available platform, and a lot of CPU power. There is no reason to use Aurora in small-mid boxes, the platform is not going to be as efficient as a standard solution like PXC. But if cost is not an issue, and the application really require a lot of parallelism, Aurora on db.r3.8xlarge is a good solution. I still see space for improvements, like for cluster connectors, or the time taken to restart a cluster after a full stop, or contention reduction. But I am also confident that the work lead by the developer team will fix most of my concern (and more) soon. Final note, it would be nice to have the code open source, to have the community to contribute, also if I understand the business reasons for not to. As most of us know, we will have the chance to attend to the MySQL conference in April (from 18 to 21). For the ones like me that had being there from long, this is a moment of reunion with colleagues and friend. It is also a moment of confrontation and sharing. In the years this conference had be the moment for the ones surfing the MySQL sea in which things can be put on the table and discuss. Very few matter if it was call MySQL conference or, as it is now Percona Live. What matter is the spirit with which the people participate, and the desire to share. One of the important aspects was and is, to be able to learn from others experience, innovation and experimentations. The past year had be a very difficult for me, thankfully only work wise, but I had also be able to be in some interesting exercises, that had allow me to come with a list of proposal that I consider quite interesting, some more some less as usual, depending from the angle you perform your work. Anyhow given this year Percona had invite the community to express an opinion on the submissions, I decide to share mine and explain a bit each of them. The first element is a tutorial on Performance schema. I know that a lot of people are talking about it, presenting in various way the usage of it, and some of the presentations are really really good. So why I should spend time to prepare a tutorial, and why anyone should attend? My answer is simple, because I am approaching it from a different angle. Most of the presentations look to it as something isolated, auto reference to MySQL space. I am looking to it as part of a larger design and vision, connecting Performance schema to the USE methodology (see other proposal about it). What I want to achieve during the tutorial is not only to provide instruction on how to access PS or what is there, but how to contextualize the information in the context of the Server(s) behavior. Learn how to use Performance Schema in MySQL 5.7 the basics and not only. The next one is a presentation that is linked to an article I wrote about the cloud, Galera, Aurora and other solutions. If you had missed it I suggest you to read it (http://www.tusacentral.net/joomla/index.php/mysql-blogs/175-aws-aurora-benchmarking-blast-or-splash.html). I had a lot of feedback about that article, from colleagues and from Amazon as well. Given the topic, and given the active evolution that a new product like Aurora is subject to, numbers and conclusion may change in short time. As such I had plan to perform additional testing during the year (2016), collecting data and present results in articles and presentations. As mentioned I had a very productive conversation with Amazon about Aurora, and given we all love to have new productive platform, able to perform at the best, I will be more than happy to run those tests with them to help them identify bottlenecks and possible solutions. As usual I will maintain my independence, transparence and impartiality, such that everyone can validate my numbers, and let us see what it will be. I cannot say or count at how many presentations I had attended, talking about Performance, and how to analyze, check or improve it. Most focus on this or that aspect of the specific storage engine, or the new feature deliver in the X MySQL release. But so far I had NOT attend to a presentation that would help me in define a methodology, an organic approach that I can use and reuse for such analysis. As such I decide to do two things, first was to write an extensive document to be used by my teams in my ex-company (Pythian), something like an endowment for them to follow and relay on to do what is needed to perform a good performance review. Second to start to talk about it and present the approach. What is important to understand, is that I am not inventing anything new, but using what had be already well defined and apply to the MySQL world. In short I will present the USE methodology (utilization, saturation, and errors), should be used early in a performance investigation, to identify systemic bottlenecks. USE can be summarized this way, for every resource, check utilization, saturation, and errors. My presentation will explain the USE methodology, and how it can help any administrator during the analysis of performance issues. It will also extend the approach for the MySQL specifics, taking advantage of Performance Schema instruments. When MySQL 5.6 comes out, I had cover with articles and presentations how to use at the best the new features related to table space managements. Covering how use the features that allow an administrator to play with them, and what kind of issues he may encounter. My next presentation is an update to it; I will also release articles about this topic during the next year, with more instructions and details for DBA to follow, also covering General table space and compression. Finally I had submitted a proposal for a topic that I personally love, which is related to Java development. Despite most nasty, and often erroneous, comments, Java is not only a very powerful programming language, but also it is used so often and in so many ways that you can easily state that every day you use several applications develop using it. What I had often found, and what I had fight against, is the very misuse of several abstraction layers, that developers often use, without understanding what they are doing. Unfortunately this is a cultural issue that had be push and reinforce in years mostly by bad developers, who do not get how important is keep in mind a very basic concept: “Scaling scenario and huge data, are not present in your laptop”. The basic meaning is, that whenever you develop code, you need to think to the big numbers, not if that functionality works now, but if it will work on a deployment of 200 application servers, and how it will impact the data layer while scaling. I will produce a series of articles about this in the future, but the first step is to explain how use and how to use correctly one of the most powerful tool we have at the moment, the MySQL Java connector. Too often I had see application relay on crazy solutions, or even crazier customize code; ignoring what is already available, able to provide quite efficient out of the box solution. This presentation, that you need to see as a first step, has the scope to start a journey, in which we will free good developers, able to think and plan application for the future, from the dumb approach often used by dull abstraction tools. I had wait a bit before asking you to vote, this because I want to explain why I had submitted what I had submit. I was also collecting information, comments and feedback about few topics; to be sure I could provide the time to my submission. What I would like now, is have YOU spend few minutes and think if any of the topic I had describe above may be of your interest. If so please follow the link and vote for the presentation, if not do not worry I am not tracing your IP and I am NOT going to send you some Italian Friends to convince you to vote for me. In light of the above tests, the recommendations consider different factors to answer the question, "Which is the best tool for the job?" If HA and very low failover time are the major factors, MySQL with Galera is the right choice. If the focus is on performance and the business can afford several minutes of down time, then the choice is MySQL with MHA. Application nodes connect to the databases either using an Aurora entry point, or HAProxy. For MHA, the controller action was modified to act on an HAProxy configuration instead on a VIP (Virtual IP), modifying his active node and reloading the configuration. For Galera, the shift was driven by the recognition of the node status using the HAProxy check functionality. As indicated in the above schema, replication was distributed across several AZ. No traffic was allowed to reach the databases from outside the VPC. ELB was connected to the HAProxy instances, which have proven to be a good way to rotate across several HAProxy instances, in case an additional HA layer is needed. For the scope of the investigation, given each application was hosting a local HAProxy, using the “by tile” approach ELB was tested in the phase dedicated to identify errors and saturation, but not used in the following performance and HA tests. The NAT instance was configured to allow access to each HAProxy web interface only, to review statistics and node status. MySQL/Galera was able to outperform Aurora in all tests -- by execution time, number of transactions, and volumes of rows managed. Also, scaling up the Aurora instance did not have the impact I was expecting. 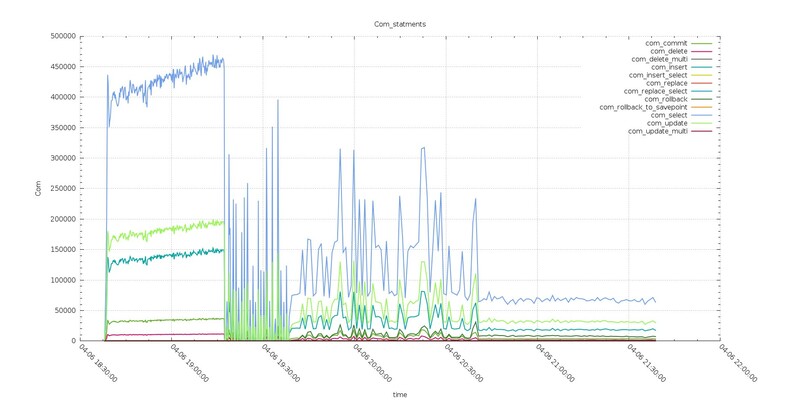 Actually it was still not able to match the EC2 MySQL/Galera performance, with less memory and CPUs. The Aurora failover mechanism is not so much different as other solutions. In case of a crash of a node another node will be elected as new primary node, on the basis of the "most up-to-date" rule.